My favorite (and I think the best) chicken noodle soup recipe! No food blog would be complete without chicken noodle soup. Our version is healthy, satisfying, and tastes incredible. Bonus, you can make this soup from scratch in under 40 minutes! 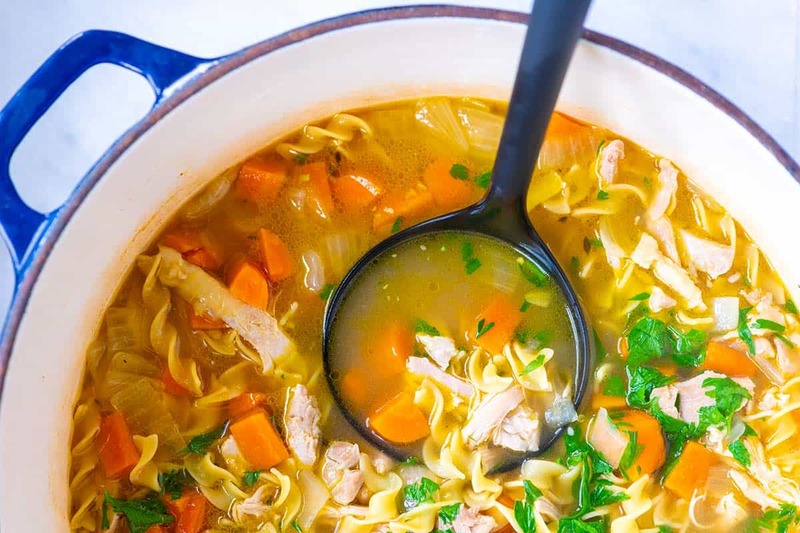 Jump to the Homemade Chicken Noodle Soup Recipe or read on to see our tips for making it. Every time I start to think about this soup, I want to make it. Classic chicken noodle soup is pure comfort food. Thankfully, our recipe is so easy, you can even make it tonight! Chicken noodle soup is one of the easiest soups to make. The ingredients are simple and inexpensive. You are looking at about 40 minutes from start to finish for this soup. Not too bad, especially when 20 minutes of that time is hands-off! We’ve made chicken soup for years and have tried it various ways. We’ve even started from a whole chicken before. I’ll take a bowl of satisfying chicken soup any day, but this version is the one we circle back to. It’s straight-forward and quick to make. It’s important to use good-quality chicken broth. While I wish we had homemade chicken broth in our freezer all the time, we don’t. When reaching for store-bought broth, we go for low-sodium. We also look for a store-bought broth that’s darker in color (usually means more flavor) and since I know it usually has more of a backbone, I like to buy boxed bone broth (we use homemade bone broth sometimes, too). In case you are wondering, we use Pacific Foods Bone Broth and also like the stock sold at Trader Joe’s. Don’t be afraid to season your soup. When it comes to soups, season early and check the seasoning often. Before we add the chicken thighs to the soup, we always check the seasoning level of the broth. If the flavor doesn’t pop, add a bit more salt. Another option is to use fish sauce. It may seem odd, but whenever we’re tasting something and it’s just missing that something something, a small dash of fish sauce fixes it. Fish sauce is a major ingredient in our Pho soup recipe. For the best chicken soup, I use chicken thighs. Chicken soup is better when made with darker meat. Chicken thighs become tender and soft in the soup — similar to how the chicken turns out in our recipe for shredded chicken. Chicken breast doesn’t tenderize and stays firm in the soup. You can use both cuts of chicken, but thighs will produce better soup. Herbs are a must in this soup — we add thyme and bay leaves at the beginning, which help to add a herby backbone to the broth. For a pop freshness, stir in a handful of chopped fresh parsley at the end. Other herbs will work, too. Instead of (or in addition to) the thyme and bay leaves, try rosemary. For the herbs at the end, try fresh chives for a mild onion flavor. As for the noodles, you can use whatever you love. We love the lightness of egg noodles, but you can throw just about any pasta into the pot. For another recipe that uses egg noodles, see our easy parmesan buttered noodles. The soup can be made and refrigerated for 3 to 4 days and frozen up to 3 months. When reheating the soup, add a bit more broth/stock to the pot. I’ve even been known to add a splash of plain water to the soup when reheating. As long as you don’t need to add a lot, it won’t thin the flavor of the soup too much. When making the soup ahead of time, for the freshest, least soggy noodles, leave the noodles out then refrigerate or freeze the soup. When you are ready to reheat, bring the soup to a low simmer and add dried noodles. Cook until they are done and enjoy. Chicken thighs make a better chicken noodle soup and are far more tender than chicken breast. For a creamy chicken noodle soup, add 2 to 4 tablespoons of heavy cream, half-and-half or whole milk. Add three to four lemon slices for a lemon chicken soup — similar to this Lemony Chicken and Vegetable Soup. Add three or four slices of lime, swap the parsley for fresh cilantro, and then add diced tomatoes and cubed avocado for Mexican-style chicken soup. You can even add diced corn tortillas as we do for this tortilla chicken soup. Add a teaspoon of toasted sesame oil and a few dashes of fish sauce for an ultra-satisfying, umami-packed soup. Swirl in fresh spinach or kale at the end of cooking for more of a vegetable-heavy soup. 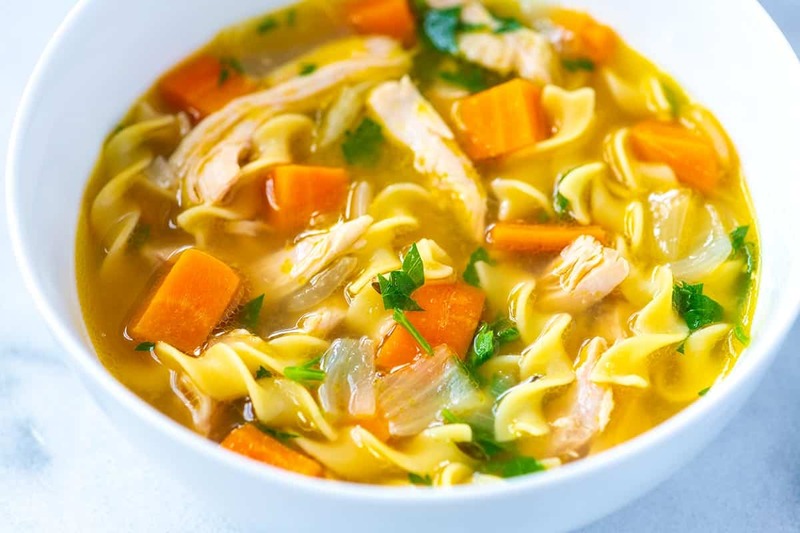 For the easiest chicken noodle soup, if you have a rotisserie or leftover chicken, instead of adding chicken thighs to the pot, add two to three cups of shredded or diced cooked chicken to the soup at the same time as adding the dried noodles. Since there is no need to cook the chicken thighs anymore, reduce the simmer time by 10 minutes. We use this method whenever we’ve roasted a whole chicken the night before. For even more tips, you can also take a read through our article for How to Make the Best Leftover Chicken Soup. 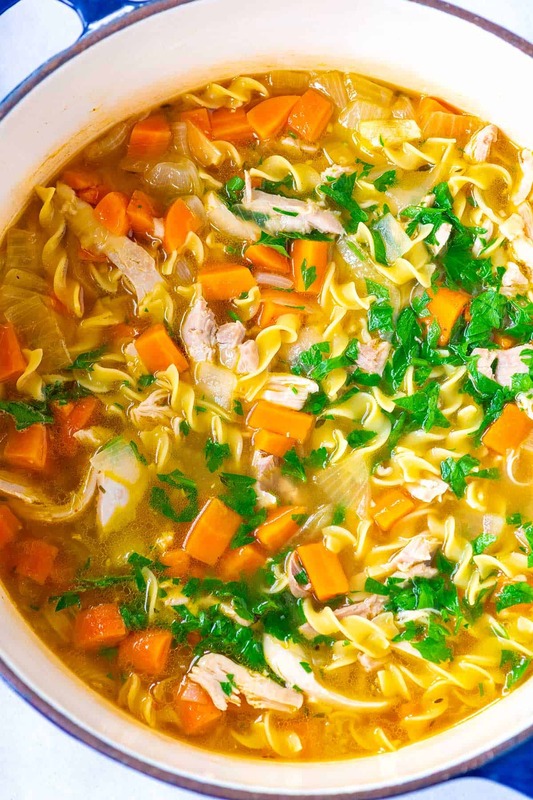 If you don’t believe that our recipe helps you achieve amazing chicken noodle soup at home, take a look at what our readers are saying about the recipe! More reviews are in the comments section below. 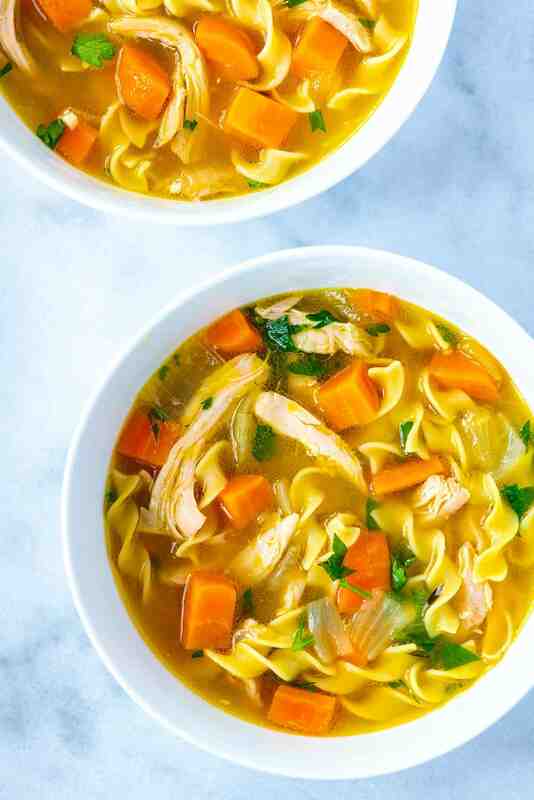 This quicker version of homemade chicken noodle soup skips cooking a whole chicken and calls on boneless, skinless chicken thighs instead. The soup still tastes incredible, satisfying, and classic. The significantly reduced cook time makes this chicken soup from scratch possible on a weeknight. 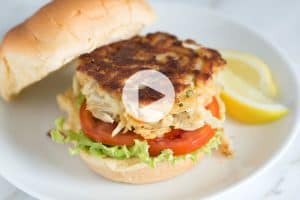 We highly recommend chicken thighs for this because of their flavor and soft texture when cooked, but if you prefer them, chicken breasts will work. Melt butter in a large pot or Dutch oven over medium heat. Add the onions, carrots, and celery. Cook, stirring every few minutes until the vegetables begin to soften; 5 to 6 minutes. Stir in the garlic, bay leaves, and thyme. Cook, while stirring the garlic around the pan, for about 1 minute. Submerge the chicken thighs into the soup so that the broth covers them. Bring the soup back to a low simmer then partially cover the pot with a lid and cook, stirring a few times until the chicken thighs are cooked through; about 20 minutes. If, during this time, the broth seems low, add a splash more stock or a bit of water. Turn the heat to medium-low. Transfer the cooked chicken to a plate. Stir the noodles into the soup and cook until done, 6 to 10 minutes depending on the type of noodles used. While the noodles cook, shred the chicken into strips or dice into cubes. Slide the chicken back into the pot and then taste the soup once more for seasoning. Adjust with more salt and pepper, as needed. Stir in the parsley and serve. Refrigerating Chicken Noodle Soup: As the soup sits, the noodles soak up the soup broth. When reheating, add a splash of extra chicken stock or if you don’t have any, water. Freezing Chicken Noodle Soup: The noodles don’t fare too well when frozen. If you plan on freezing the soup, remove the portion of soup you plan to freeze before adding the noodles. Freeze the broth, chicken, and vegetables. When you are ready to reheat the soup, add dried noodles to the soup and simmer until done. Seasoning the Soup: If you feel the soup is missing some zing, add a bit more salt. 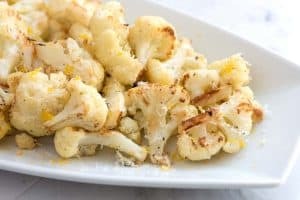 You can also add a pop of flavor with a squeeze of fresh lemon juice, a dash of fish sauce (we use this trick for store-bought stocks and broths often) or Worcestershire sauce. This was the second time I’ve ever cooked and it was not only good, but also very straightforward! I was feeling under the weather, so I decided to try this recipe out! I seasoned the chicken and baked it first before putting it into the soup, and it tasted divine! The soup turned out amazing, and I will be using this recipe from now on 🙂 Thank you so much for sharing your recipe! Amazing!! I’ve done chicken soup many times and it usually comes out bland or subpar. This recipe worked out great, love the flavours! Thank you, this is my new go to!! Wow! Made this tonight for the kids and it got a yummy thumbs up!!! It was soooo good, thanks for the recipe! I made this soup tonight and it was D-Lish!! Everyone loved it and I can’t believe how easy it was to make. I’ve never made homemade chicken soup before so thanks for a great recipe. So glad I found you guys! I finally decided to make some chicken noodle soup. So glad I tried this recipe. I added a small amount of sesame seed oil, as I have made egg drop soup, and I really loved the flavor. Thanks for an easy soup recipe. My first time ever making chicken noodle soup and it came out amazing!! I’m definitely gonna make this recipe again. Thank you! My son is trying to get over the flu.I needed that endorsement! My new go to recipe for Chicken Noodle Soup! I made this while visiting family a few weeks ago. Six adults and four kids, everyone LOVED it…. twenty thumbs up! The only change I made was using Oregano instead of the Thyme, (the closest I could find in my sister in laws spice cabinet), other than that, followed it exactly. Thank you for a perfect recipe! I didn’t have time so I first cooked the chicken in the pressure cooker and then used the stock and chicken in the soup. I was surprised how tasty it was. Thank you for sharing. This soup is so flavorful! Reminds Me of great chicken noodle soups you can only get at a NYC deli. This combination of herbs is what I have been missing in my recipes. Thank you! This soup is so flavorful! The only addition I made was to add matzo balls. I simmered them for 20 mins after the chicken was done. Five minutes before the matzo balls were done simmering, I added the egg noodles. You will need to add more broth to accommodate for the matzo balls. About 2 1/2 cups more. I’ve been making a lot of soups and stews in my instant pot, any tips for timing when making this in an instant pot? My experience has been to use less liquid when pressure cooking, would that hold true for this soup add well? I love the fish sauce suggestion, will definitely try it. Thank you. Hi Edith, We are currently working on adding an Instant Pot/pressure cooker version of this recipe. You should not need to reduce the liquid (just make sure you do not fill the pot past the maximum fill line). I’d cook the chicken in the soup base first (I’d assume you will need 7 to 8 minutes of pressure cooking), and then add the noodles and cook until done. Turned out very good. I added a half of a chicken bullion cube and a dash of poultry seasoning. Made the soup with my 12 year old granddaughter. It was awesome. We made fresh semolina egg noodles and it was a great addition. 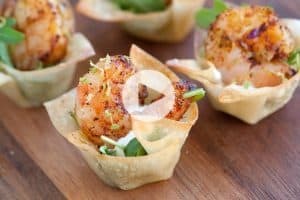 Great easy to do recipes. Would love to see more low carb high protein recipes! Thanks! I made it tonight with rotisserie chicken. I simmered the spine bones for about 30 min and added more chicken. It was amazing. To thicken up the soup my friend puts in couple of raw eggs. The soup was amazing. I will definitely make it many more times. Thank you!! I was after the ultimate cold & flu remedy so as well slices of lemon, I added a generous amount of grated ginger, a tsp of turmeric and a sprinkling of cayenne pepper alongside the garlic. I threw in some mushrooms and Chinese cabbage with the noodles and it was delicious! Invigorating and comforting all at the same time! Delicious!!! I added extra chicken so the men would have more meat. I also diced up a zucchini to add. i made this as soon as i saw the recipe. and then made it again the next night to see if i could do it in an instant pot. i could. it was just DELICIOUS both times! THANKS for a great recipe!! 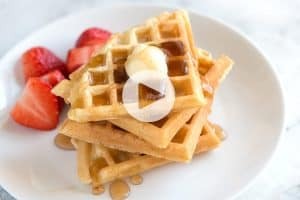 Any tips on how you did this in the instant pot? Thank you! Very good recipe. I cut it in half as it is just the wife and I. Used bone broth, chicken thighs and fresh thyme and parsley. The wife and I both had two bowls and are looking forward to the test tonight. Thank you so much for the really good eats. John C.
I really like your recipe and I tried it, and it was too yummy.